© 2017 by Kelly Smith; all rights reserved; content may not be copied, rewritten, or republished without written permission. We all want to live in a warm, inviting home and we all like the idea of boosting home equity. There are many ways to reach these goals but many of them are cost prohibitive. When it comes to bang for your buck, its paint to the rescue. In particular, this means accent walls. For years the “one red wall” line of thought reigned supreme but times have changed and there are many more interesting ways of expressing your personality. An accent wall should be the focal point of the room. Do you look directly at one wall when you enter? Many times the focal point is behind the sitting area where the entertainment center is located on the opposite wall. All homes are different but you get the idea. 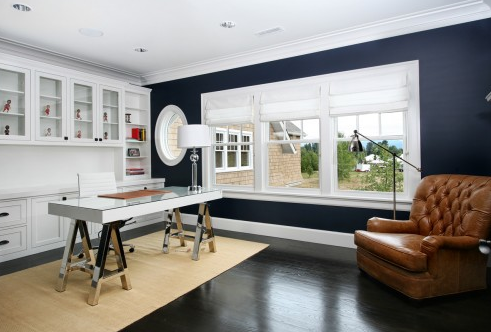 Your choice of paint color is an important consideration. It should suit your individual taste but still work well with the other colors and furnishings in the space. Neutral colors can be problematic since they tend to have color undertones and temperatures that might make the accent wall look woefully out of place. Of course you do not have to go with a basic color; you can add personality as well. For example, faux finishes have never gone out of style and make for a great weekend DIY project. If one solid color is not particularly to your liking, think about taking it a step further with wall stencils. Using neutral colors with stencils is very popular right now. For example, stenciling with white over a neutral wall will yield a sophisticated look thats not overwhelming. As far as the pattern is concerned, geometric and Moroccan styles are very popular (important if selling your home is on the horizon). Wallpaper is a very viable option to paint. It certainly gives you many options that are difficult to achieve with paint. Not confident in your ability to hang wallpaper like a pro? Consider going with temporary wallpaper, also known as “renters wallpaper”. Does your wall look short for the space? Consider paper that incorporates vertical stripes; this creates a kind of optical illusion of a taller wall. On the other hand, horizontal stripes will make your room look longer. Stone is a great way to giver your space that rustic look. No, you dont have to make a trip to the local quarry and hire a stonemason. Today faux-stone murals and panels are available to make installation virtually hassle-free. With stone it is important to consider your furniture and decorations in order to get the look just right. Wood is obviously a better choice than some fabrics. Light fixtures made of oil-rubbed bronze or even wrought iron look right at home against a stone accent wall background. Tile is another popular material. Luckily, you can get the look without going to all the trouble. Tic Tac Tiles Peel and Stick Wall Tile in subway white (10) will give you a very sleek and modern look. Do you have any accent wall tips that would benefit our readers? Please share in the comment section below!